You are currently browsing the tag archive for the ‘Kathryn Belmont’ tag. Of all the classic Walt Disney features, ‘Alice in Wonderland’ had the longest and most troublesome history. Lewis Carroll’s book had intrigued Walt Disney for years. It had inspired the Alice cartoons, if only in name, and already in 1933 the first ideas appeared to turn the literary classic into an animated feature, starring Mary Pickford as Alice – being Disney’s first feature idea ever. Unfortunately, the idea was dropped because in 1933 Paramount released their version of the classic tale. More serious work on Alice started in 1939/1940 when illustrator David Hall made numerous, exceptionally beautiful concept drawings. After the failures of ‘Pinocchio‘ and ‘Fantasia’ (both 1940) at the box office, these ideas were shelved, and virtually nothing of Hall’s ideas entered the final film. At one point even novelist Aldous Huxley cooperated, turning in a literary script in 1945, which the Disney studio found useless. Only in 1949 real work on the film began, resulting in Disney’s second feature of the 1950s, after the successful ‘Cinderella‘. The final film unfortunately was poorly received when it was finally released in 1951. It performed rather badly at the box office, losing the studio almost a million dollars, practically evaporating the profits that ‘Cinderella’ had made the previous year. The film was critisized even by its own animators. Marc Davis said the film “gave us nothing to work it” and called it a “cold film”. Frank Thomas and Ollie Johnston hardly mention the film in their elaborate book ‘The Illusion of Life’. In ‘The Disney Villain’ they reveal why: they felt they “had failed to find the intriguing combination of fantasy, satire and whimsy that made the original book popular”. Even Walt Disney himself denounced the film, saying it lacked heart. 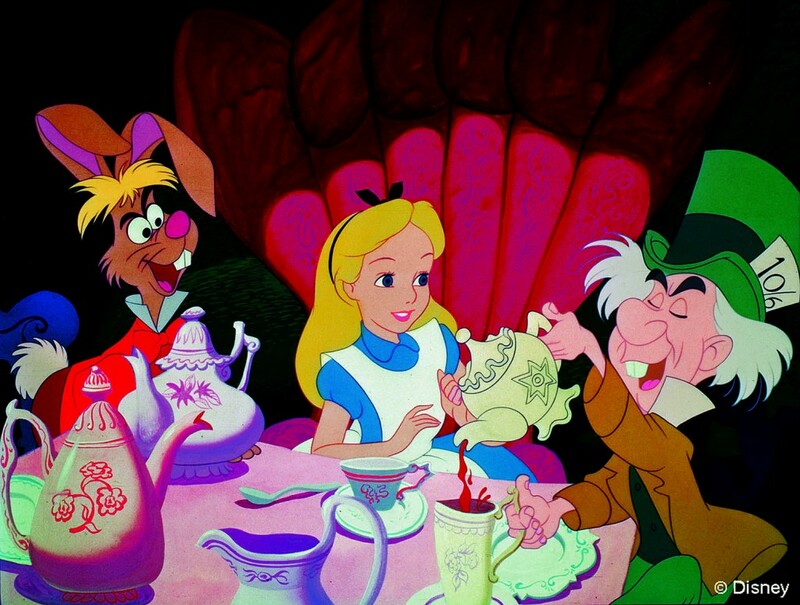 However, ‘Alice in Wonderland’ has aged suprisingly well. In fact, it has turned out to be one of the best adaptations of the book to the screen, its only serious rivals being Jan Švankmajer’s disturbing stop motion film from 1987, and a NBC production from 1999. Certainly not Disney’s feature from 2010, which, although visually stunning, owes very little to the original story. The film’s most overt weakness, its episodic character (which, of course, it shares with the original book), is also its strong point: none of the Disney story cliches are apparent, and there’s a welcome lack of sentimentality to the film. In fact, the film’s low point is reached when the studio does try to squeak sentimentality into the story: in the Tulgey Wood scene, an invention of the story department and not found in the original book, Alice has enough of nonsense, wants to go home and feels lost. She sings the feature’s weakest and most forgettable song with a sobbing voice, with some fantasy birds sympathizing with her in stereotypical Disney fashion. Despite the inventive bird designs, this scene is wide of the mark. Luckily, it is one of only two weak scenes (the other one being the flower scene, squeaked in from ‘Through the Looking Glass’) amidst the wonderful series of utter nonsense, which evoke the zany spirit of the book very well. The film is literally stuffed with great characters, most of them voiced by well-known British and American actors: the white rabbit (Bill Thompson, the voice of Droopy), the dodo, Tweedledee and Tweedledum (Pat O’Malley), the caterpillar (Richard Haydn), The Cheshire Cat (Disney favorite Sterling Holloway), The Mad Hatter and the Marc Hare (Ed Wynn & Jerry Colonna), the Queen of Hearts (Verna Felton), and the little king. Eleven year old Kathryn Belmont is a perfect Alice: pleasantly normal, and a little pedantic, just like the one in the book. Of all Nine Old Men, the Disney animators who worked on the film, Ward Kimball in particular seems in his element, as Lewis Carroll’s work has much in common with his own zany type of humor. Kimball supervised animation on Tweedledee and Tweedledum, the Walrus and the Carpenter, the Mad Tea Party and the Cheshire Cat, and all characters are delightfully loony. However, the film’s strongest point may be in its design, which is nothing like Sir John Tenniel. In contrast to his gloomy black-and-white engravings, styling artists Mary Blair, John Hench, Claude Coats and Ken Anderson present a vibrant world of colors. The stylized backgrounds are superb with their angular designs and highly original color combinations, evoking a perfect dream world. It’s these designs that give the movie unity. They are matched by the looniest animation within any Disney feature, all bringing the zany Lewis Carroll perfectly to life. Both the animation and the countless visual gags complement the textual madness of the original book. Moreover, the film is surprisingly speedy, and still enjoyable for a 21st century audience. ‘Alice in Wonderland’ may not be Disney’s best or most successful feature, it’s a very pleasant ride through a colorful world, and more of a timeless classic than anyone would have imagined in 1951.